Belarusian anti-authoritarian activists; Ihar Alinevich, Mikalai Dziadok, Artsiom Prakapenka, Pavel Syramolatau, Aliaksandr Frantskievich, Jauhen Vas’kovich were sentenced to 3 to 8 years in prison for a series of attacks on state and capital symbols, and are finishing their second year inside. 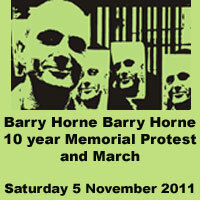 In October 2011 they were acknowledged as ‘political prisoners’ by rights-watch organisations. This improved their chances to be freed, as the President of Belarus, Alexander Lukashenko, faces pressure from the European Union to free all political prisoners. He has already pardoned more than 30 of them, but none of our anarchist comrades were granted freedom. There are currently 15 people listed as ‘political prisoners’ in Belarus, Lukashenko has stated that he will freeonly those who write a petition for pardon, admitting their guilt and asking him personally for mercy. Five of the inprisoned activists have refused to sign, whilst Artsiom Prakapenka signed it under pressure but remains in prison. 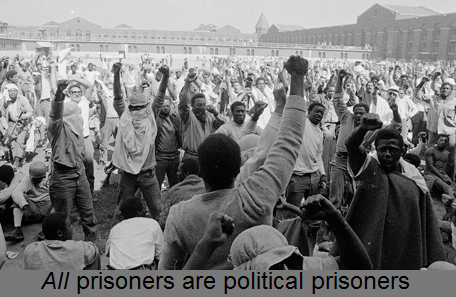 All the remaining ‘political prisoners’ are under pressure from the prison authorities to sign the petitions. Methods to attempt to force them to do soinclude; transfers to other penal institutions, preventing food supplies coming in, preventing and limiting visits from relatives, denying phone calls, delays and gaps in the receipt of letters, solitary confinement, transfer to a penal facility with a ‘special regime’, etc. The anarchists federations that met together at the IAF Congress in St. Imier, Switzerland strongly oppose the fact that our comrades are now being traded for benefits from the EU and condemn the pressure that they have been experiencing. We call on everybody to protest on the 22nd and the 23rd of September [the day of the Belarusian elections] against these tortures and demand the immediate liberation of all political prisoners of Belarus, including anarchists and democracy campaigners. (includes excerts from statement by the International of Anarchist Federations). A demo in London has already been announced, and we hope to have some more actions around the UK, including in Bristol. Pleaded guilty in May 2012 to violent disorder during the Stokes Croft riots. Paddy was sentenced to 14 months, of which he will serve 7 months due to his early plea. He is a Greek socialist who was involved in various activist groups and recently moved from HMP Horfield after tying to unionise G-wing. Paddy appreciates letters, cards, newsletters and books. At 4 o’clock in the morning of June 13th, 2012, the carabiniers of the Special Operations Group (Raggruppamento Operativo Speciale, ROS) raided about forty homes, implementing the so-called ‘operation boldness’ (operazione ardire), a crackdown against people from the anarchist movement ordered by Manuela Comodi, public prosecutor of Perugia. According to the regime’s media, a total of 10 arrest warrants were issued—eight within Italy, one sent to Germany and one sent to Switzerland—while 24 suspects have been put under judicial investigation. The Italian bourgeois Press did not hesitate to connect the arrested with ‘the anarcho-insurrectionist FAI/FRI [Informal Anarchist Federation / International Revolutionary Front]’. Among the names of investigated suspects are also those of some imprisoned comrades that are prosecuted for the CCF [Conspiracy Cells of Fire] case in Greece. RESISTRANCE returns on 3 December bringing ya an all-nighter to remember! 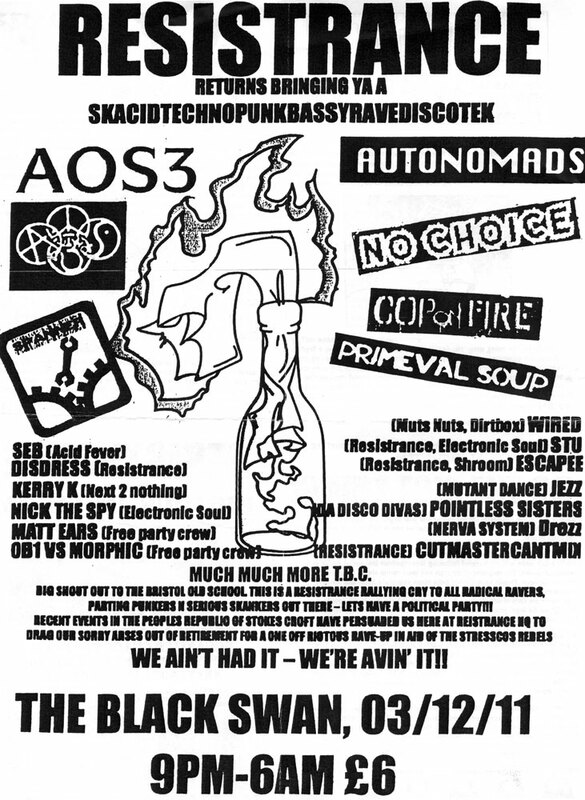 Band lineup so far includes: A0S3; Autonomads; Cop on Fire; Spanner; No Choice; Primeval Soup. Plus at least 2 rooms of DJ’s and crews, and much much more TBC. 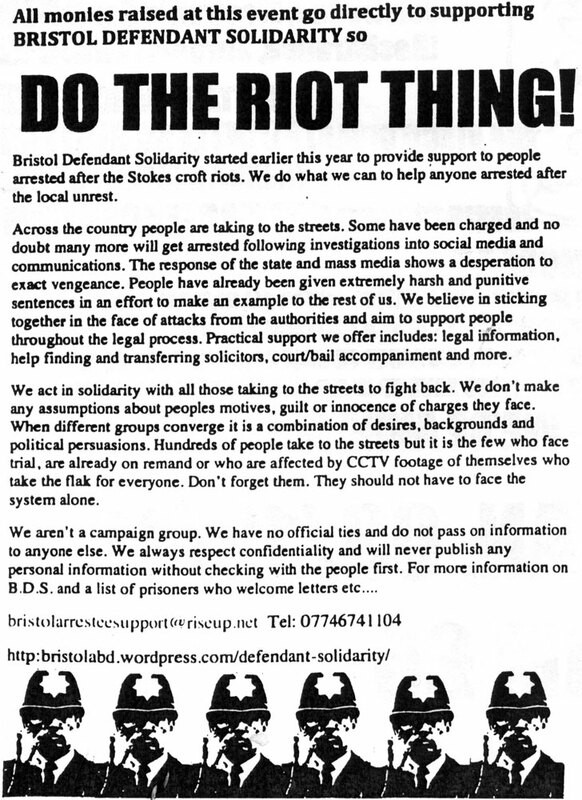 All monies raised go directly to support Bristol Defendant Solidarity. Barry Horne was an animal liberationist who quite literally died for his beliefs whilst serving an 18 year prison sentence. Whilst in prison he engaged in 3 hungerstrikes in less than 3 years, the first two whilst he was still on remand.